Are extractive companies operating on Indigenous land overvalued? WASHINGTON, Oct. 30 /CSRwire/ - First Peoples Worldwide released its Indigenous Rights Risk Report at the The SRI Conference on Sustainable, Responsible, Impact Investing. The report analyzed 52 U.S.-based extractive companies listed on the Russell 1000® Index and assessed 370 oil, gas and mining sites located on or near Indigenous Peoples land. The results are eye opening. 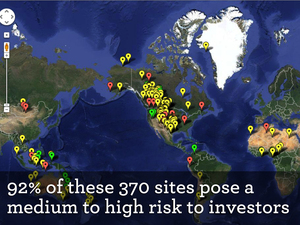 92% of the sites posed a medium to high risk to shareholders. This is concerning given that only 5 of the 52 companies had an Indigenous Peoples policy for productively engaging Indigenous communities, leaving shareholders exposed to considerable risk. You can view the full report online at www.firstpeoples.org/indigenous-rights-risk-report. One of the companies First Peoples assessed was Southwestern Energy, which on October 6, 2013, a stock analysts said: “looks like a great long-term investment” and “it is a low political risk company.” Less than two weeks later, on October 17th, the Royal Canadian Mounted Police (RCMP) arrested about 40 Elsipogtog and Mi’kmaq First Nations tribal members and activists, using rubber bullets and pepper spray. The protestors had been blockading the road to SWN Resources Canada, a subsidiary of Southwestern Energy, since June. Southwestern Energy had requested "a permanent injunction to prevent protests against its bid to explore for gas," claiming the blockade was costing them $60,000 a day. However, the injunction was denied on October 22nd. There is no timetable for when the blockade and Southwestern Energy's losses will end. Given this rosy stock forecast in the face of these troubling events, are traditional approaches to assessing the risk of oil, gas, and mining operations located on or near Indigenous Peoples land relevant anymore? First Peoples does not think so and has proposed a new risk assessment tool in its new Indigenous Rights Risk Report. In the report, First Peoples rated the above-mentioned Southwestern Energy site a "High" risk. "Traditional financial analysis is no longer enough to predict the risk of an oil, gas or mineral site that is on or near Indigenous land," says Nick Pelosi, First Peoples' Corporate Engagement Associate. "The risk of not respecting Indigenous Peoples' rights must be considered for an accurate risk assessment." Southwestern Energy is not alone. Nearly all of the companies in the study had a medium to high-risk profile. Of the companies that had over ten sites operating on or near Indigenous land (25 percent of our sample), 92 percent had at least one high-risk site and 23 percent had over five high-risk sites. Take into consideration that only 5 of those companies have an Indigenous Peoples policy, the vast majority of companies are flying blind when it comes to operating on Indigenous land, thus exposing their investors and shareholders to incredible risk. The risk of not respecting Indigenous Peoples' rights is only going to increase. First Peoples president and co-founder Rebecca Adamson forecasts a confluence of events that will make the extraction of oil, gas and minerals from Indigenous land riskier in the future. She says, "First, Indigenous Peoples have more rights enshrined at the international and national level, and are exercising them more effectively than ever before. Second, as extractive industries search the globe for oil, gas and minerals, they are finding them increasingly on or near Indigenous land. And third, digital media is allowing Indigenous Peoples and their allies to access and share information more easily, giving them the ability to tell their story and conduct advocacy campaigns on a global scale that can directly impact the profitability and value of a company." Therefore, it is more critical than ever for investors and shareholders to be able to access unbiased information about Indigenous Peoples and from Indigenous Peoples so they can make sound investment decisions. First Peoples hope this report will be a risk analysis tool for investors and shareholders as they make investment decisions in the extractive industry. Ideally, it will also act as a platform for Indigenous Peoples and investors to collaborate together on shareholder action campaigns that drive policy changes companies need to make to respect the rights of Indigenous Peoples and maximize shareholder returns. View the full report online at www.firstpeoples.org/indigenous-rights-risk-report. Learn more about First Peoples Worldwide at www.firstpeoples.org.